I've been replacing many of the frequently used light bulbs in my home with LED bulbs and wanted to see if I could also use LED light bulbs in my seed starting table to successfully start my vegetable garden seeds this year. Prices have come down and a lot of new types of LED bulbs have been released in the past couple of years and I wanted to see if this would be a good spot where I could save some money. 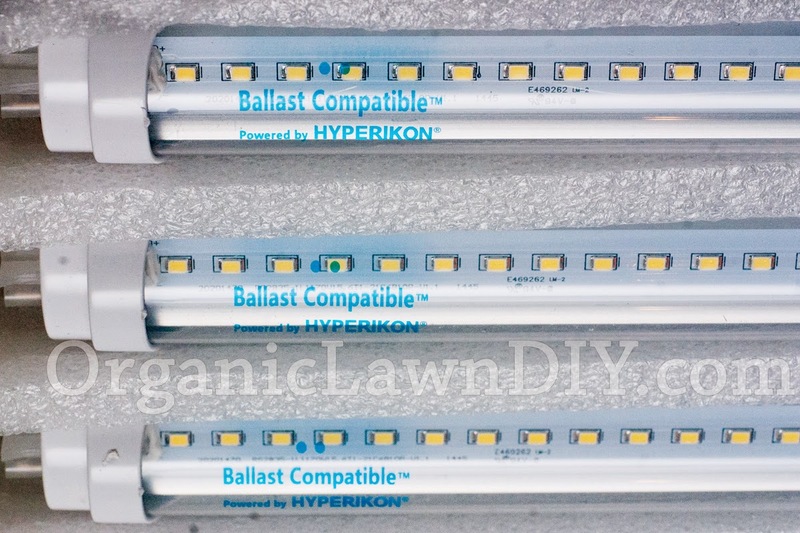 One new bulb that caught my eye were these T8 BallastCompatible® 2.0 Hybrid, 18W 4FT LED Light Tubes from Hyperikon® due to the favorable reviews. The BallastCompatible bulbs can be installed in traditional T8 fluorescent fixtures without any modification and will give you an equivalent of 40W of light output per bulb while only using 22W of electricity. The bulbs should work in most fixtures unmodified but if the bulbs start to blink on and off or exhibit any other odd behavior you'll need to rewire the fixture to bypass the ballast. You'll probably want to rewire the fixture anyway because doing so will save even more energy as the bulbs will only consume 18W instead of 22W. I had no issues running the Hyperikon bulbs in my Commercial Electric 2 light 4' fluorescent shop light fixture with the ballast but I do plan on rewiring it. These Hyperikon bulbs aren't special plant grow bulbs. As I mentioned in a previous article on plant grow lights, any daylight (5000K-6500K color temperature) fluorescent bulbs will work for starting plants indoors from seed that will eventually be brought outdoors. If you're going to have flowering and fruiting plants grown indoors constantly, then you may need to invest in more expensive aquarium/plant lights but for just starting seedlings daylight colored bulbs work as well, if not better than grow lights. But will vegetable seedlings grow well under regular LED bulbs like they do with regular fluorescent bulbs? That was the big question I wanted to answer so I set up one of my batches of tomato seeds under the Hyperikon bulbs to see if they'll work. I set up my seed starting table in front of a south facing window in a warm room like I normally do. Even though it's a south facing window I found that in the past, before I used lights over my seedlings, the seedlings wouldn't get enough light and they'd get leggy. I think it's a combination of other structures blocking light and that there are a lot of rainy and overcast days this time of year. After I started growing them with additional light the stems stay short and get very thick. The plants also grew healthier and wound up producing more too. Here you can see a time-lapse video of tomato seeds germinating and growing under the Hyperikon BallastCompatible tubes over a 2 week period. I ran the lights 24 hours because it made it easier to create the video and I've also found that my tomatoes do better with constant light instead of the normal 12-16 hours of light. The video gets a little choppy at the end because the backup battery I use while the primary battery is recharging died. I'd normally keep the lights a little lower too but needed to leave extra room to take pictures of the seedlings. 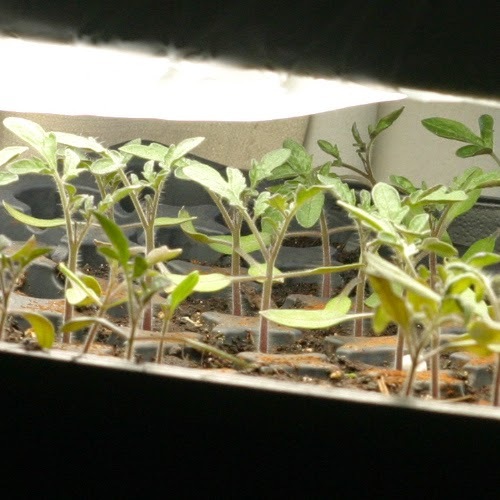 As you can see though, the tomatoes did great under the LED tube lights. They grew nice and thick stems and stayed short which they wouldn't have done without supplemental lighting. Here's a still from the end of the video. There was really only one issue using the LED bulbs. 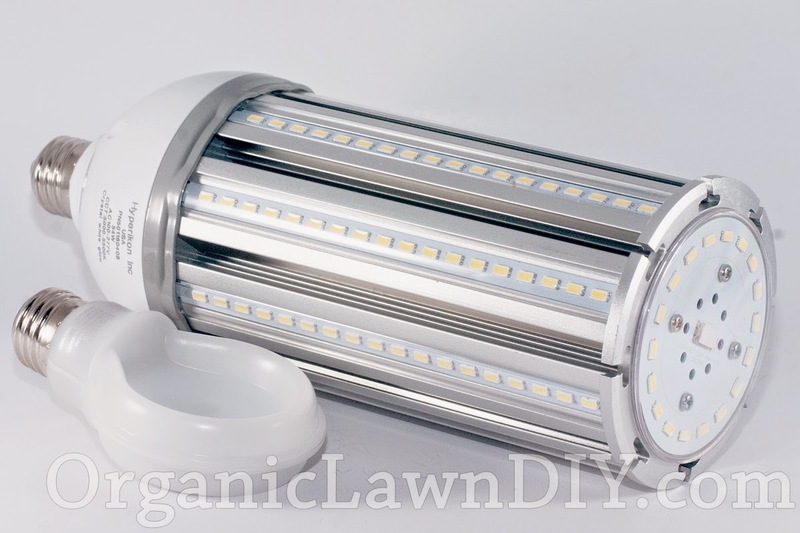 Since LEDs produce more directional light and the LEDs are only on the bottom of the tubes, plants on the outside edges of the tray furthest from the bulbs were developing a very pronounced lean towards the center. The bulbs I used had a clear cover but I think the Frosted Hyperikon® LED Light Tubes would be a better fit as they will produce a more diffuse light. As you can see in the video I added some diffusion material under the bulbs which helped. I just taped some white plastic kitchen garbage bags around the fixture. The leaning wasn't a big problem. Once the plants started to go outside to harden off they straightened up and all the plants are at similar heights. Next year though I'm likely going to use a 4-tube shop light such as the Lithonia Lighting 4-Light Heavy Duty Shoplight to get better coverage over the trays. I'm either going to space 2 lights further apart in the fixture (if that's possible) or just use 4 bulbs and reduce how long I keep the lights on each day. I'm satisfied that the bulbs perform at least as well as the daylight fluorescent tubes I was previously using. Now let's look to see if the savings are going to be worth it. Let's assume you only grow two trays of seeds a year under 2 light tubes which you keep on 16 hours a day for a total of 4 weeks before you move them outdoors. This is the minimum use for seed starting lights. In my area electricity costs about $0.15 per kWh. With fluorescent tubes you'll pay $4.30 to power the lights for 4 weeks at 16 hours a day. With the Hyperikon bulbs it will only be $2.96 if you don't remove the ballast from your fixture and $2.42 if you do remove the ballast. That's a minor savings that doesn't really justify the extra cost of the LED bulbs in the short term but what does justify the cost is not having to replace fluorescent tubes every year. Fluorescent tubes lose brightness pretty quickly and I have to purchase new bulbs every spring to get adequate light output. That's an additional $9.97 per year. 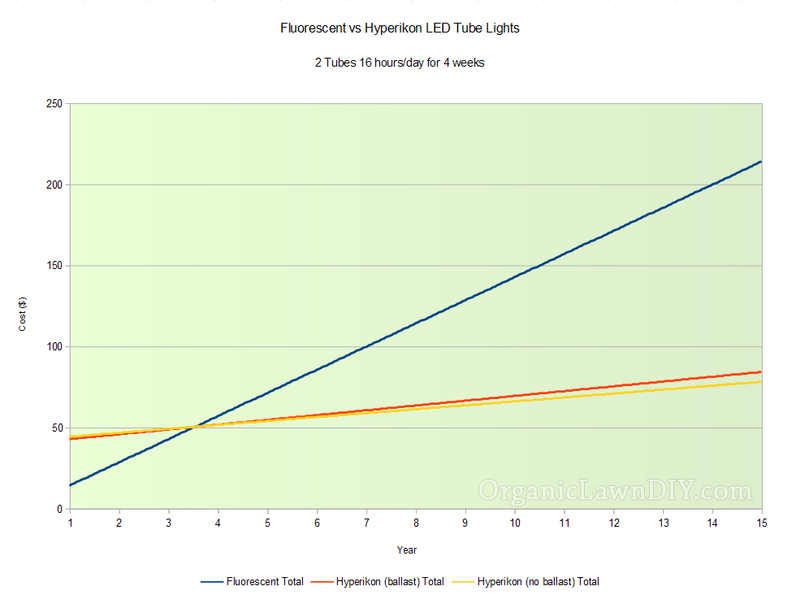 The Hyperikon LED bulbs will last for many years (decades really when only run 4 weeks a year) before the light output has diminished to the point where they no longer provide adequate light output. When factoring the cost of bulb replacement you'll realize savings in the 4th season of use even when just using the lights for 4 weeks a year to start your seedlings. You probably don't use your seed starting lights for just 4 weeks a year though. I typically run lights for at least 8 weeks each spring which would make me realize savings in the 3rd season. The more you run your lights, the more money you'll be saving switching to LEDs. 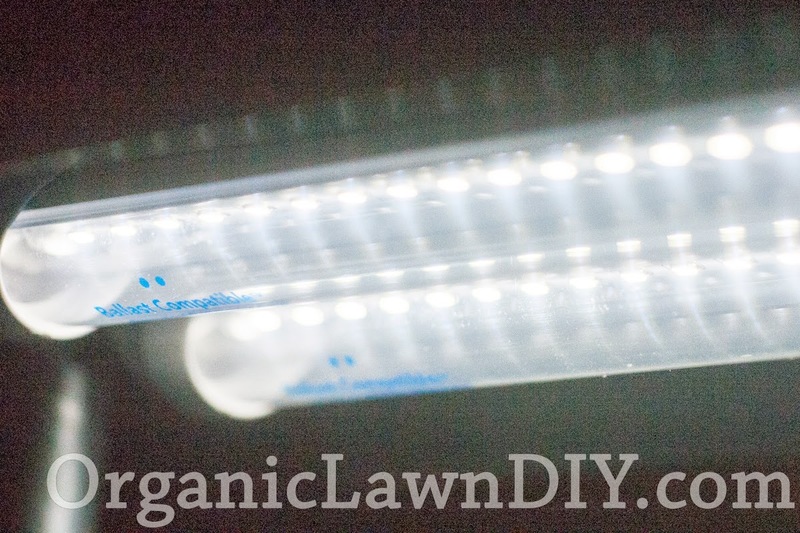 For use as seed starting lights fluorescent tubes will need to be replaced every year due to how quickly the light diminishes. That has a big impact in cost savings but also has the added benefit of being more convenient. Not only do you need to make a trip to get new tubes you also have to remember to bring your old tubes to be recycled. That's inconvenient and you're producing more waste. Fluorescent tubes contain mercury and are made of glass. Neither of which you'd want to wind up in your potting soil. You can accidentally break them while setting up your seed starting bench, adjusting the height of the lights or moving trays in and out of your bench. The Hyperikon BallastCompatible tubes have a plastic cover which isn't as fragile as glass and there's no mercury. While fluorescent bulbs don't get that hot, and having the plants touch the bulbs won't immediately harm the plants, prolonged exposure to the glass can result in damage to the plants and can be a safety issue. The Hyperikon bulbs are cool to the touch. The only thing warm in the fixture is the ballast which should be bypassed to save more energy. I also got the chance to try out another energy saving LED bulb from Hyperikon. After transplanting from plug trays to larger pots the seedlings need a day or two in a darker room to recover from the transplant shock My garage is very convenient for this purpose but it doesn't have any windows. I also use my garage to protect my plants on nights when temperatures approach freezing to prevent losing plants to frost. I have the Hyperikon® 501080408 model LED Street Light Bulb which uses 54W to put out light equivalent to a 380W incandescent bulb. It's big but this model has an E26 base that will fit in a standard light socket. Here's a picture of it next to a more conventionally sized bulb to give you an idea of its size. I installed this in a reflector and hung it in the middle of the garage. It's dimmable but I didn't have a dimmer handy for it. Instead I was able to control the light intensity by raising or lowering the light in relation to the trays I had on the garage floor. After transplanting, I had the light fairly high to provide less intense light that was similar to how much light would be in the garage if it did have indirect light from windows. For a couple of nights in a row there were concerns of frost so I brought the plants into the garage at night and kept them there until following day after the sun had sufficiently heated the greenhouse. In these cases I hung the light lower to provide higher intensity. While the plants could have gone a bit with less light I didn't want to slow their growth. The bulb does get warm but even after a couple of days of continuous use it wasn't too hot to handle. The amount of light it puts out is impressive considering it uses less energy than a standard 60W incandescent bulb. The inside of my single car garage was about as bright as a heavy overcast day. If you do have a greenhouse or an indoor growing setup where you are only dealing with vegetative growth these would save a considerable amount of money over 400W HPS lights. A more practical purpose would be to use them for what they're intended for. To replace high wattage sodium vapor lights in a parking lot or warehouse. They use only about 14% of the energy and will need to be replaced far less often. You can use LED lights to start your vegetable seeds indoors and you don't need special plant grow lights to do so for plants that will eventually be planted outside. The Hyperikon BallastCompatible tubes make it easy to upgrade because they'll fit in your current T8 fluorescent fixtures. Upgrading to LEDs is just a simple matter of replacing your current tubes. In some cases you may need to rewire the fixture to bypass the ballast but it's a good idea to do that anyway because it further reduces energy consumption by 25%. If you have a lot of fixtures you can rewire them a few at a time while still gaining the benefits of LED bulbs in all your fixtures. These benefits include lower energy consumption, much longer bulb replacement intervals, less heat output and no glass or mercury hazards. Although I used the clear version I think the frosted Hyperikon BallastCompatible tubes would be a better choice. Plants furthest away from the tubes leaned strongly towards the light and a more diffuse light source would help. This lean isn't harmful and will correct itself when you bring the plants outside to harden off. At about $20 per tube the bulbs are affordable and you'll start to see savings after 3 years even if you're only using them for 16 hours a day for 4 weeks a year to start your vegetable seeds. If you use the lights more you'll see your savings sooner. The Hyperkon bulbs are very well made and the company was very responsive when I had questions concerning installation. Thanks! This was exactly the solution I was looking for to grow my tomato seedlings, too. Thanks for the helpful information. I have put some geraniums from last summer under a LED shop light to over-winter and they are amazingly happy and blooming, which I didn't expect. So based on your notes and the geranium evidence, I think I'll use LED shop lights to start some seedlings too!